Sometimes I like to get away even when I am away. Such was the case this past Sunday. 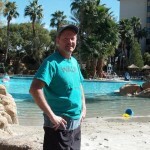 I was at our cabin, located near Yuba, Wis., and decided to take off for a day. I had spent most of Saturday working (mowing and other chores), and just needed a break. I have wanted to visit the Kickapoo Valley Reserve for sometime. It’s nearby–only about 30 minutes from the cabin–and has a bit of history behind it. (More on that shortly.) Even better, the Reserve offers thousands of acres of pubic land that one can escape to. So I did. I pulled into the main parking a little before 10:00 a.m. As I approached the visitor’s center, a beautiful building designed by KEE Architecture of Madison, Wis., I was struck by the names inscribed on the outside walls. 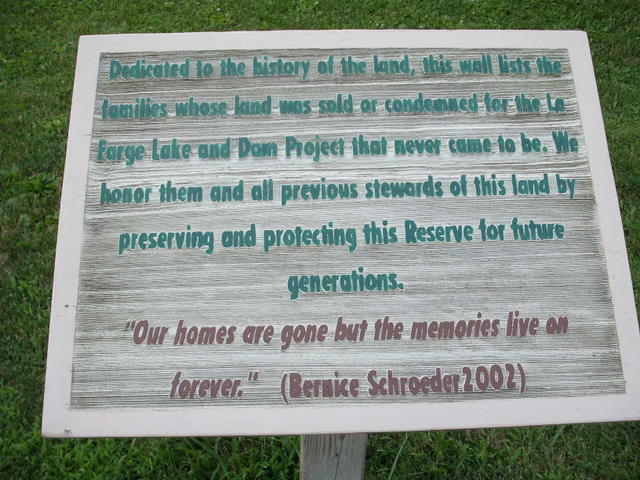 Each family whose property was taken for the valley project is memorialized there. The sign near the front door says it best (click to enlarge). The Kickapoo Valley Reserve is the result of efforts to deal with severe flooding caused by the Kickapoo River. A flood in 1935 caused extensive damage to buildings and property in La Farge, Wis. Another, in 1951, claimed 10 lives. In 1962, Congress authorized the US Army Corps of Engineers to design a flood control dam at La Farge. It would create a reservoir 400 – 800 acres in size; later plans called for expanding that to a 1,780-acre lake for recreational use and power generation. Over time the government bought out 149 property owners north of La Farge–many of them unwillingly. As cost estimates and environmental concerns escalated in the 1970s, pressure mounted to scrap the project. Over half of the dam had been completed when work stopped in 1975. In 1996, legislation introduced in Congress authorized transferring the land, totaling 8,569 acres, to the State of Wisconsin. 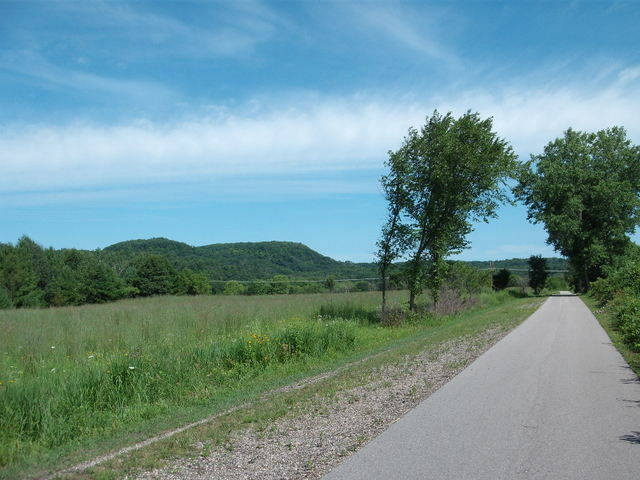 This was contingent on 1,200 acres being returned to Ho-Chunk Nation, the original inhabitants of this part of Wisconsin. The legislation also called for rerouting Hwy 131 and two county roads. The land was officially transferred over on Dec. 28, 2000. 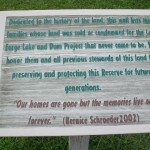 The Kickapoo Valley Reserve was dedicated on May 11, 2001, and an interpretive visitor’s center opened on Oct. 21, 2004. 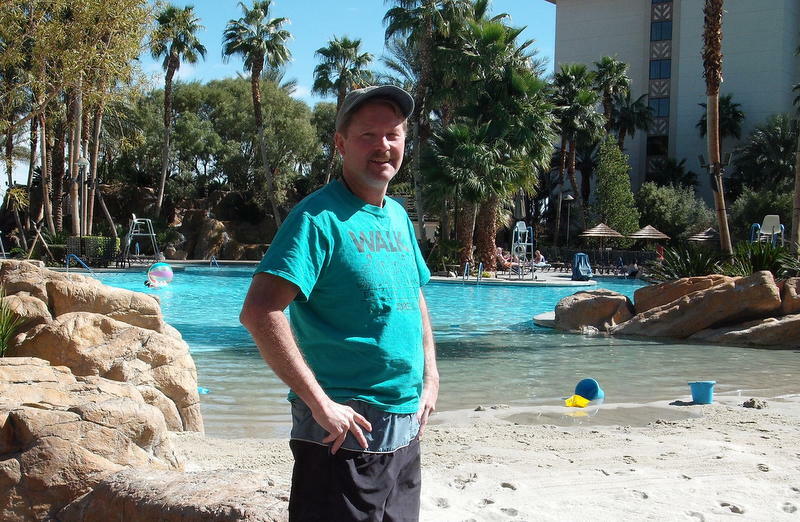 The Reserve offers year-round recreational opportunities. Learn more at their website. Not sure where to begin, I asked receptionist Ali Dickson for advice. Dickson, a senior at UW-Stevens Point working her second summer at the visitor’s center, suggested the Little Canada Trail. Its dirt trail and natural setting are very appealing, she said. As that would involve driving a short distance, I decided to strike out right from the center. Nearby is the Old Harris Road Trail, a gently sloping path approximately 0.5 miles long. Assorted trees, including black walnut, boxelder and white pine make up an interesting mix of forest. Other than a cottontail rabbit that stepped out to greet me, I was the only creature on the trail. 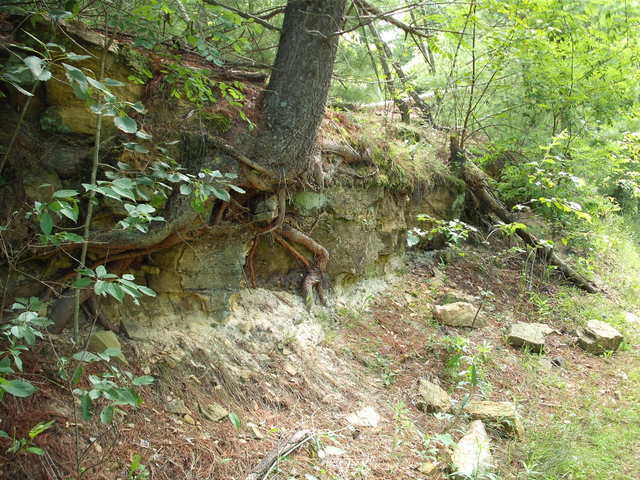 The trail provides a glimpse of the layered sandstone beneath. Sandstone is common here in the Driftless Area, so named because the glaciers missed when they came through Wisconsin thousands of years ago. 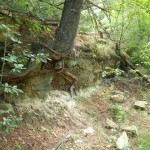 While various species can grow in this soil, white pine thrive. It’s not uncommon to find a tree clinging to exposed rock. 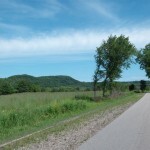 Although we are in the Driftless Area, Old 131 is fairly level and very easy walking. The road runs through the low lands, passing vast open stretches of land on the left with an occasional tilled field of corn or soybean on the right. Natural ponds, one with an accessible pier, beckon hikers to stop along their journey. I walked up to Bridge 16, which is about 1.5 miles from the visitor’s center. Rustic campsites, each with a capacity of 10 people, are sprinkled along the trail. According to Dickson, these are located where the old homesteads were; some still have functioning wells. The walk was very peaceful, with just the birds and breeze to keep me company. The road is level and an easy walk with comfortable shoes. Sun protection is recommended for walking during summer days. After a relaxing lunch break, I headed for Little Canada Trail. Access is gained from County P, about 2 miles north on current Hwy 131. Find Old 131, and walk south for about 5 minutes. Once you enter, you realize why this is a popular trail. Heavily wooded, it really allows you to escape. My loop consisted of the Little Canada Trail to Ice Cave Trail, and back again. Total distance was about 2 miles. Were it not for the pesky mosquitoes, this would have been a really pleasant hike. Early on the trail offers a slight climb as it follows the contours of a ridge. Then you enter a forest of white pine, and your nose picks up that welcoming scent. The trail climbs and dips at times, and you’ll need to watch for the occasional embedded rock and exposed tree roots. Horse apples, too. Trail intersections are well marked. The adventuresome can pick up West Ridge Trail about a half mile in, and take that to the western edge of the Reserve. I needed to get back, so I turned onto Ice Cave Trail. Both trails are of moderate grade but fine for most hikers. A lookout point along Ice Cave Trail allows you to relax and enjoy the lowland below. As was the case with my morning jaunt, this hike lasted about 2 hours. While I covered just a small portion of the Kickapoo Valley Reserve, it gave me a new appreciation for this land – and the people who once called it home. I intend to return and continue my exploration of this beautiful portion of Wisconsin. Wear comfortable shoes. I wore athletic shoes, and had no problems. Consider the surface. Do you have difficulty walking on a paved surface? If so, when on On Old 131, use the shoulder (but watch for the horse “apples”. You may find hiking boots helpful on the undeveloped trails. Bring lots of water, and bug repellent would be helpful in summer months. Deer flies and mosquitoes are thick in some places, especially if you stop to take pictures (and notes, as I did). Avoid wild parsnip (Pastinaca sativa). The oil from this plant causes blisters when the skin is exposed to sunlight. “[It] would be a bummer if you touched it,” Dickson says. As long as you stay on the trails, you should be fine. Even so, learn what wild parsnip looks like, and avoid it. If hiking alone, take sufficient supplies. Tell someone where you’re going and when you’re expecting to return. Cell coverage was available the two times I checked. (My carrier is US Cellular.) I had a solid signal on Old 131, but a minimal signal while on Little Canada Trail. The Reserve is administered by the Wisconsin Department of Tourism. State stickers do not apply there. Admittance is free, but certain parking lots require a pass. You can buy one at the visitors center or at self-registration stations throughout. Trails are multi-use. Watch for horses and bicyclists. Have you visited the Kickapoo Valley Reserve? Feel free to share your experience(s) below. And if you found value in this post, please share it with others. You may use any of the buttons below.